I love the taste, but I think it's also the memory as well. I grew up in the suburbs of Chicago and our local doughnut shop was DUNKIN' DONUTS. The coffee was good. The doughnuts were fresh. My Dad used to go there every morning on his way to work. He worked a lot and got up very early. He started out as a short order/line cook at my uncle's restaurant when we moved to Chicago from Greece. He eventually became the managing chef at another Chicago restaurant before he went on to owning his own little place. No one worked harder or was more loved by his co-workers than my Dad. He often worked two shifts and sometimes, even three. He would come home between shifts to grab a 30 minute nap and some of my Mom's cooking. He worked around food and prepared it all day long, but he thought my Mom's food was the best. It was. He made a mean soup and could grill with the best of them. I rarely spent time with my Dad. His work made it difficult and I can only remember the man taking a real vacation twice in his life. On certain weekends he'd wake me up really early (before the sun was even up) and we would drive to our local Dunkin' Donuts. He'd have a coffee and I'd get a chocolate milk. 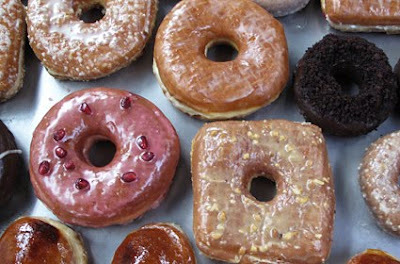 We'd sit at the counter, eat and drink our breakfast and bring home a dozen. I'd go back to bed and he'd go off to work. The ritual (minus the going back to bed) is one that I still practice. Here's to Mondays, great coffee & doughnuts AND my Dad. Miss you. Thank goodness for Dads. My Dad used to make homemade doughnuts for us and turned it into a family effort. Gosh, what fond memories. What a sweet story, Angelo. That's a great story. Here's to your Dad! I raise my coffee mug and donut. Heart-warming and heart-tugging. I'm sure your Dad would be so proud to see that you've used your skills, blessings and hard work to enrich the way others love.